Some games come in more travel friendly shapes and sizes. 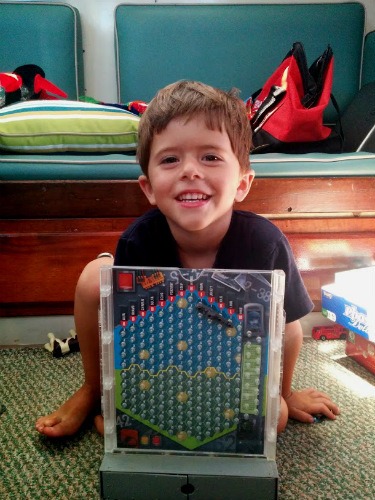 This is our Battleship game. In Downsizing for the Boat: Part 1, I talked about how we downsized our big ticket items. Today, I’ll show you something even more critical to living on a boat…entertainment! Board games, DVDs, CDs, and books all have the challenge of taking up a lot of space. I know some people with personal libraries at home that almost require half of their house in shelving (or have to be stored away in boxes)! How do you bring along plenty of entertainment for long days on the water without overwhelming your space requirements? Most of the books we decided to bring were reference guides of some type. First, let’s talk about books. I am a total book lover, bordering at times on serious addiction. Someone on an online forum recently asked the question, “Could someone recommend a good short book that can be read in about 2 days?” I couldn’t help but laugh, as I had just devoured an entire series in the past two days. The problem with that habit is buying books is expensive and they take up a lot of space. Luckily, with the advent of the ebook (and libraries renting them) my appetite can be sated without breaking the bank or sinking the boat. Most libraries now have the ability to rent a large collection of ebooks at no charge to members, just make sure you have your account set up before leaving and your library card is not going to expire soon. 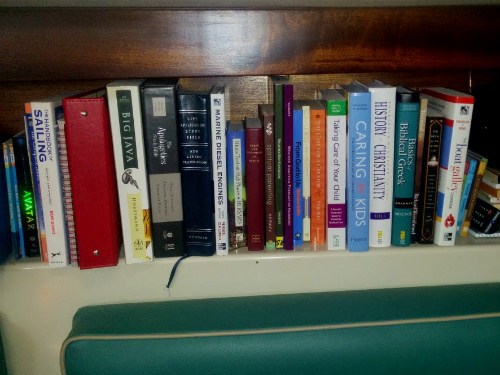 Before moving aboard, we went through each book in our physical library and asked the tough question, “Are we going to use this while cruising, or not?” If the answer was no, we attempted to sell it on Amazon and eBay. Most got bought up within a month or so and the rest we donated to our local library. (With the exception of our Harry Potter series. Too big for the boat, but no way we could get rid of a collection we grew up on…it’s now taking up precious space in our 2 trunks left behind.) We have 2-Nexus 7 tablets on board as well as a ink-reader Kindle for reading in bright sun. Ebooks are definitely the way to go whether you pay for them or not, as buying and storing books just doesn’t make sense even on a large boat. Fitting all of our movies into one case…Inconceivable! 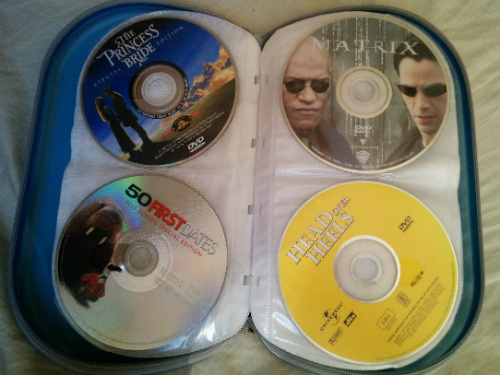 Movies and CDs are a lot easier to downsize, as the main goal is to eliminate the overly large plastic jewel cases and consolidate the discs to a case. Another option is to eliminate the disks all together by transferring all of the movies and songs onto portable hard-drives that you can plug into a computer. We chose to just store our discs in a case since it really didn’t lose a lot of space overall to keep them, plus updating our music collection on our phones (default mp3 player!). One large case and a full recycling bin later and we’ve downsized without actually getting rid of anything. Once again, we couldn’t quite get rid of our collector’s edition Avatar case, because well…its Avatar. So yea. From all of those boxes into the bags. Saving space has never been easier! Finally, we wanted to bring some board games along, but knew that we didn’t want to store huge game boxes. Luckily, most board games take up very little space once taken out of their original packaging. 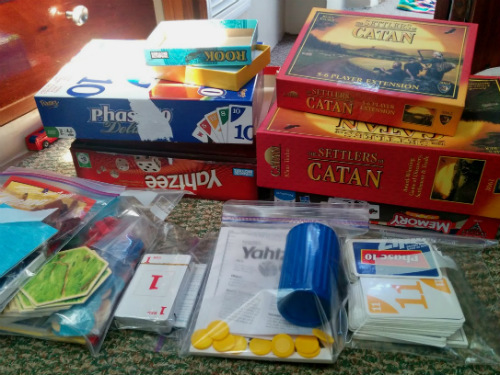 A few Ziploc bags of varying sizes changed a huge stack of game boxes into one tote bag of fun! Now we have all of our favorite games, i.e. Settlers of Catan, easily available with using up precious space on the boat. All part of the art of downsizing without dumping!